It's time for another Dollar Buy (and another post...finally)! My second trip to Dollarama was just as productive as the last and I came home with a few great finds for under $3. Can't beat that! I'll save my Super Mario purchase for later. Today I'm opening up my Avengers: Grab Zags. 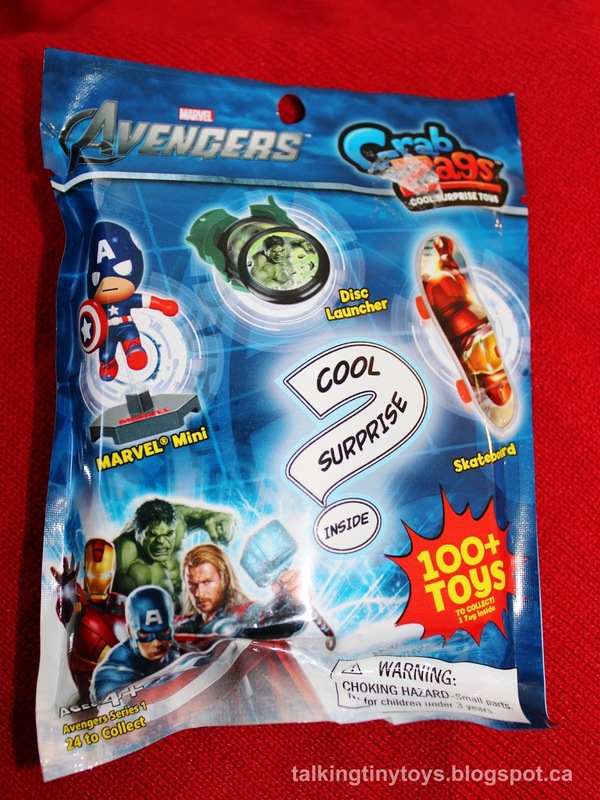 I've seen these blind bags in store before and although I'm a huge Marvel fan, I've been hesitant...and not because of the stupid name. The reason? Take a look at the list of available toys. Do you see the problem? 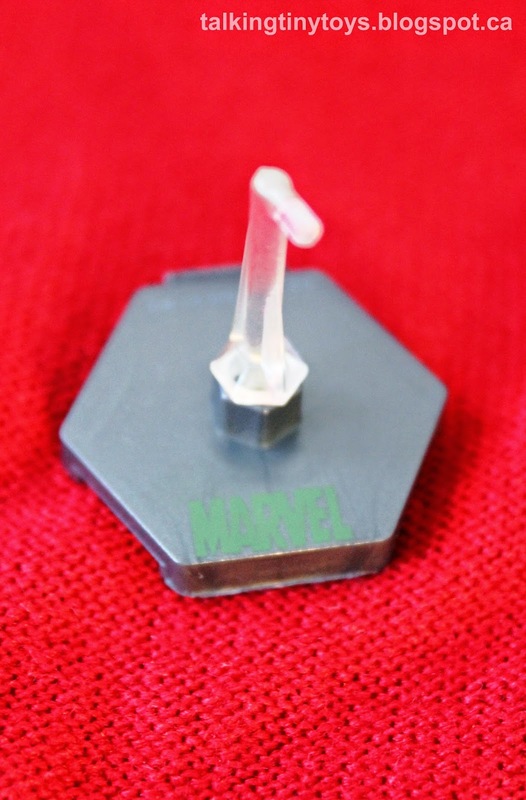 Sure, the Marvel Minis are super-cute, but what the heck am I going to do with a skateboard or a disc launcher? Since the bag is pretty thin, I did my best to feel out the toy inside and put back anything that felt flat. I found one that seemed to be the right shape. Should I press my luck? (Of course I did). 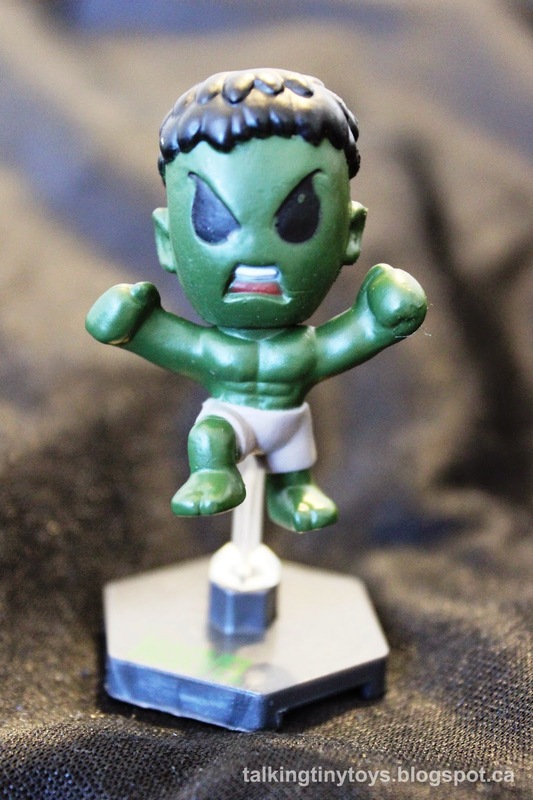 No discs, no boards, just a tiny Hulk! Honestly, as long as it was a Marvel mini I was going to be happy with my purchase. From the packaging, each of the available characters looked like they had an interesting (and adorable) sculpt. Their odd eyes/eyebrow combination separates their look from the various Funko and Kid-Robot toys out there. 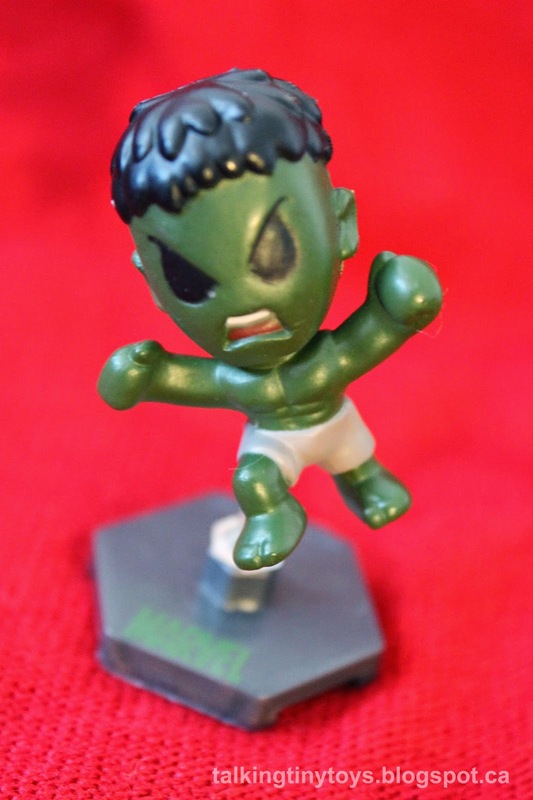 The Hulk's paint job is decent and the body shape is dynamic. I would have liked purple shorts instead of the white, but that's nitpicky. The green pain is pretty dark but still contrasts with the black hair. I love the droopy hair mold and his angry expression. He looks like he's going to smash! Another nice feature is that he come with a stand. The two piece stand snaps together easily and fits into a hole in the middle of the toy's back. The base says Marvel in green, but is really difficult to read because of the shade they chose. The stand allows for a few different poses, but be careful! 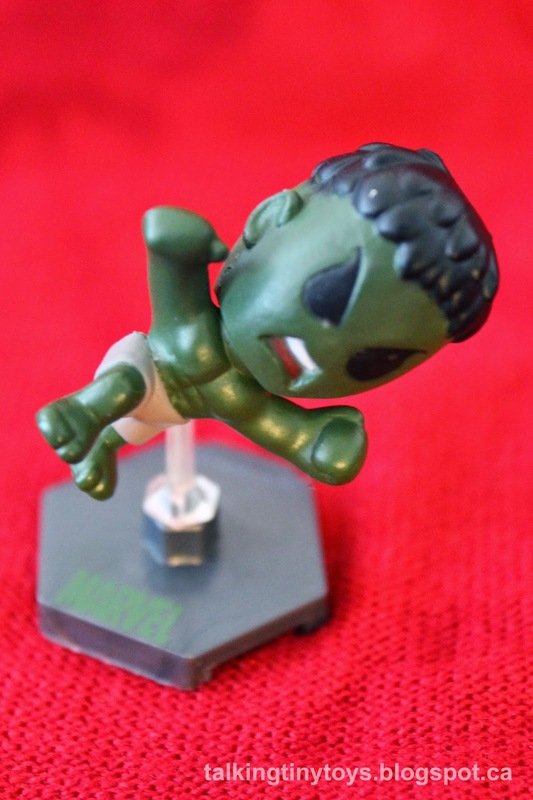 Hulk is a little top heavy, so he'll topple if off centre too much. 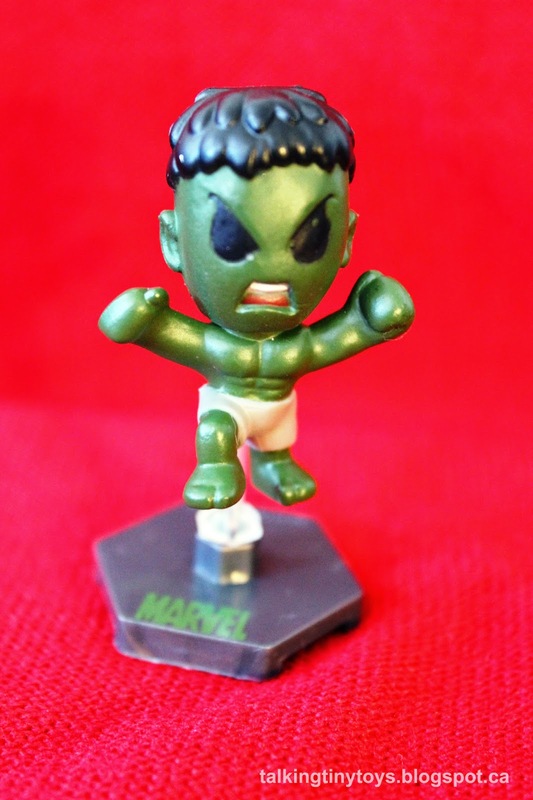 While I didn't find the "Ultra Rare Captain America," Hulk is nice surprise. 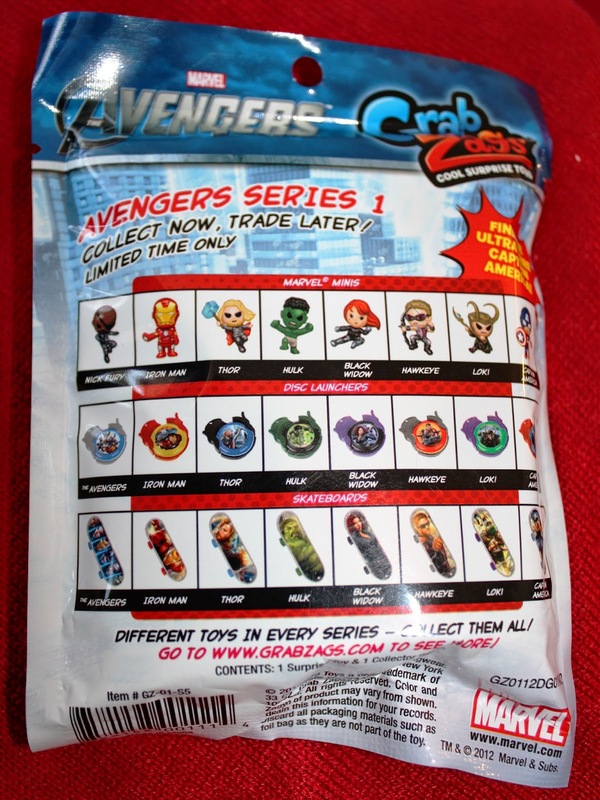 I'd recommend these blind bags...if you can narrow your choice down to the minis. I might try again in the future. 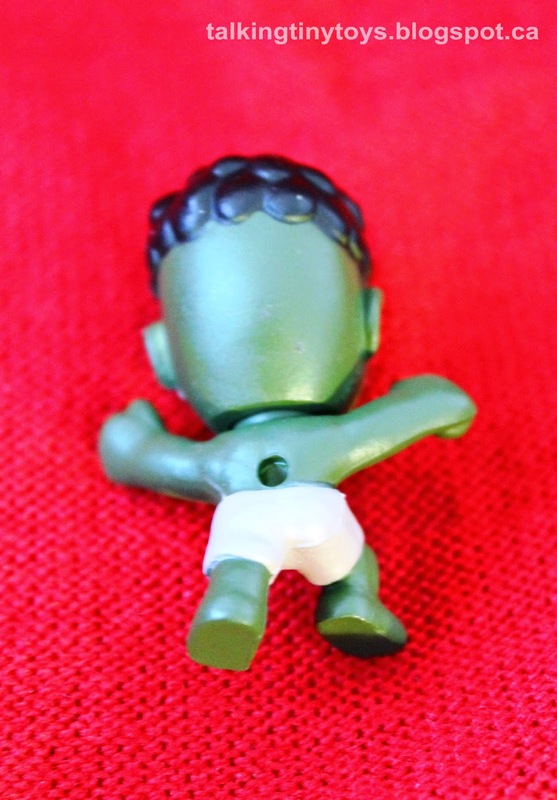 I think Hulk needs a friend.